This is a fairly simple recipe to execute, but the way the pieces go together really blew me away. Here’s where I will try to explain why it had such a profound effect on me. When I made the Chicken Ropa Viejo, I naturally ate some of it. The taste is terrific, but I have to admit that the leanness of the chicken breast puts it ever so slightly on the dry side. This isn’t an issue, since I expect to enjoy it with a slew of different things (like guacamole, salsa, and so on). But, I did notice. The mofongo recipe that follows technically doesn’t need to have any meat in it. 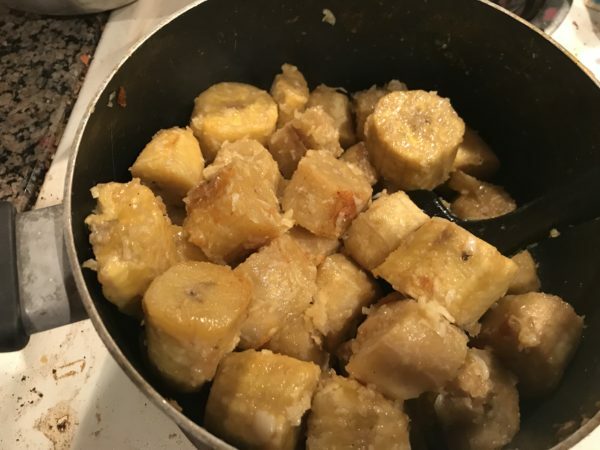 It can be seen as sort of a garlic mashed potatoes, with plantains in place of potatoes. 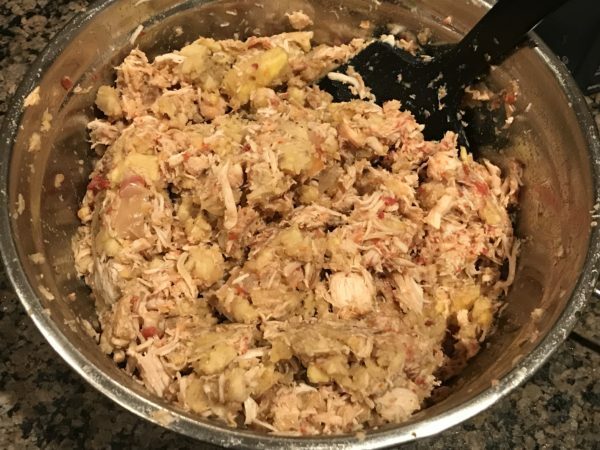 I tried some before I mixed in the chicken, and it was tasty…but also pasty: the starch of the plantains made this inevitable. So, it was a surprise to find that mixing the two together actually improved both. The starchiness of the mofongo seemed to bind to the chicken and provide the moisture that it (somewhat) lacked. And, the savoriness of the chicken elevated the plantains beyond where they would have been on their own. It actually gets better. 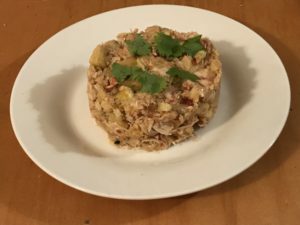 While this chicken mofongo is terrific as-is, it also takes very well to salsa, guacamole, sour cream…and I can honesty see rolling some up in a tortilla and having it that way. As a side note, I understand now why mofongo recipes always call for green plantains. One of the plantains I bought ripened, and seriously tasted just like a banana. The sweetness would have been distracting. Now, the part I’m not so thrilled about. I’m baffled as to why Weight Watchers says that 1 plantain is 10 points, whereas bananas are 0 points. The carbs (31 to 27) are similar, as are the calories (110 to 90), and the nutritional value is comparable. I would have expected this to weigh in significantly lighter than Weight Watchers says it is. 2 cups chicken stock or juices from Chicken Ropa Viejo. 2 pounds Chicken Ropa Viejo - see linked recipe. 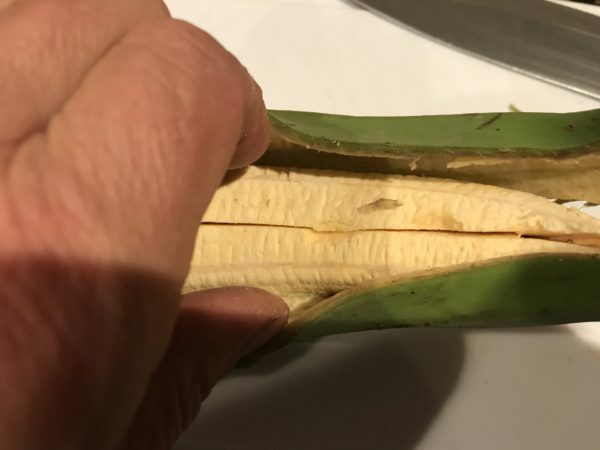 Peel the plantains: the skin is so thick that you will need to cut a slit down the length of the skin. Make sure to cut no more than about 1/4" (6 mm) deep (I did cut somewhat deeper than I wanted here, but it didn't harm the final product). Cut plantains into 1" (25 mm) chunks. Place in a pot with chicken stock or juices from Chicken Ropa Viejo. The redness of the juices here are from the tomatoes used in the ropa viejo. Bring to a boil. Cook for 10 minutes. Remove from pot with a slotted spoon and discard the juices. Melt butter in the same pot, then add garlic. Saute while stirring continuously for 2 minutes or until they just start to brown. 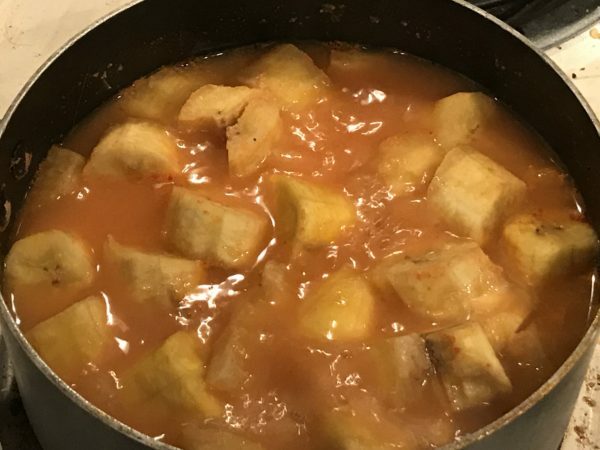 Add plantain chunks to the pot. Stir to coat, then continue heating to brown the plantain chunks slightly. 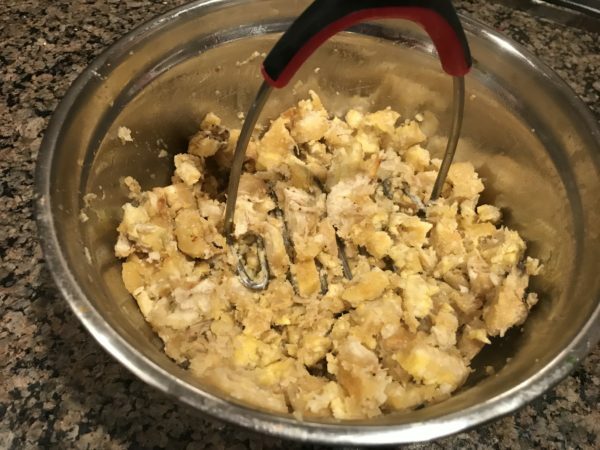 Smash plantain chunks in a molcajete (mortar and pestle) or place plantain chunks in a bowl and smash with a potato masher just enough to break the skin. Don't work so much that it turns to the consistency of mashed potatoes. Mix plantain mash with Chicken Ropa Viejo. Blend evenly, but try not to break up the plantain chunks. Form using a ring mold. Garnish with cilantro if desired.